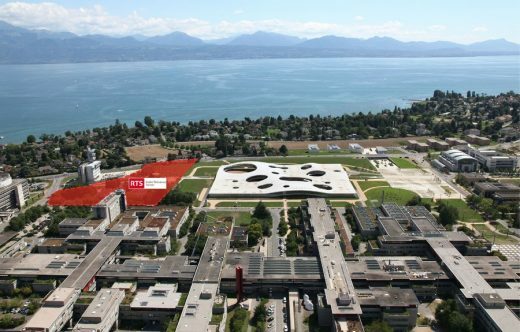 The Radio Télévision Suisse (RTS) is planning the construction of a new multimedia site next to the campus of the federal polytechnical school of Lausanne (EPFL) and the university of Lausanne (UNIL). The new building should embody innovation and awareness in new trends, in new behavior of the public, in mixing of cultures, ideas and opinions as well as new technologies. In association with the Swiss Company of Broadcasting (SRGSSR), the RTS organizes a parallel development study to one degree in selective procedure. Every candidate must, at the time of the deposit of the candidacy file, dispose of a diploma giving the right to practise as an architect in Switzerland or have a foreign diploma benefiting of the equivalence. Where necessary, the architects with a foreign diploma or those who are registered on a foreign professional register will have to bring, in the first requisition, proof of the equivalence of their qualifications with regard to the swiss requirements. Within the framework of the procedure of selection (stage 1), the association of offices and subcontracting are not authorized. May 9, 2014 in Competitions.